Fingies & Fries – So… What Should We Make? Who doesn’t love chicken fingers and fries? Here I make a lighter, healthier take of a childhood classic. You can make homemade chicken strips in a variety of ways, but the two ways my roommate and I enjoy them most is with corn flakes or panko bread crumbs. Here I work with cornflakes, but I will also post a d breaded recipe in the next few weeks. This seems like a time intensive recipe, but it’s deceiving as the majority of it is spent cooking – I promise you won’t have to do too much work! This recipe makes for approximately 4 servings. Mix the garlic powder, paprika, salt and pepper in with the flour. Get 3 shallow bowls. Pour the flour mix in one, the corn flakes in the second and the whisked eggs in the third. 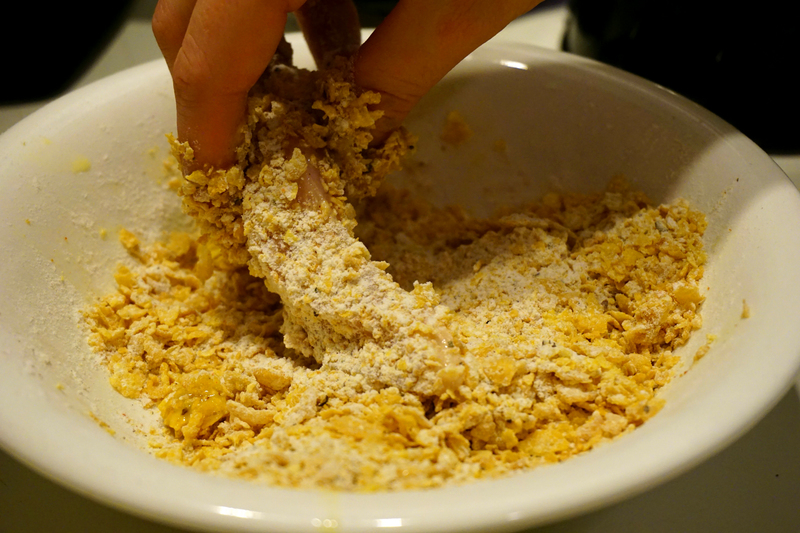 Cover your cut chicken strips in the flour mix, then in the egg wash, and lastly dredge them in corn flakes. Place the chicken strips on a baking sheet. Line with aluminum paper for an easier clean. If you do not line the baking sheet, make sure to grease the baking sheet with some oil. Cook for approximately 18-20 minutes on the middle rack. Flip half way if desired (although it’s not necessary). Cut your red potatoes into thin wedges as seen below. Try to make all your wedges the same in thickness to ensure even cooking. Place potatoes in a mixing bowl and pour 2-3 tablespoons of vegetable oil, as well as garlic salt, paprika and chilli powder over the potatoes. Combine until the potatoes are evenly coated. Place potatoes on a greased baking sheet. To ensure that your wedges turn out crispy vs. soggy, they should not overlap on the sheet while baking. Cook for approximately 20 minutes on the lower rack of the oven. Again, you do not have to flip halfway but you can if you would like to. Once you remove the chicken strips from the middle rack, move the potatoes up to the middle rack and switch the oven setting to a low broil. This will help to ensure the wedges are extra crispy. Allow to cook for another 2 minutes before removing them from the oven. Once removed, immediately sprinkle some seasoning salt over them and allow to rest for 2 minutes before serving. Now, because the FNH student comes out in me and I feel guilty when my meals aren’t totally balanced, I served this dish up with some broccoli. And of course, homemade honey mustard sauce (all you need is plain yogurt, yellow mustard and honey – I play around with the relative amounts until it tastes right to me). You don’t have to cook the whole batch of chicken strips once they’re breaded. You can put the extra uncooked, breaded strips in Ziploc bags and freeze them for when you want them next.